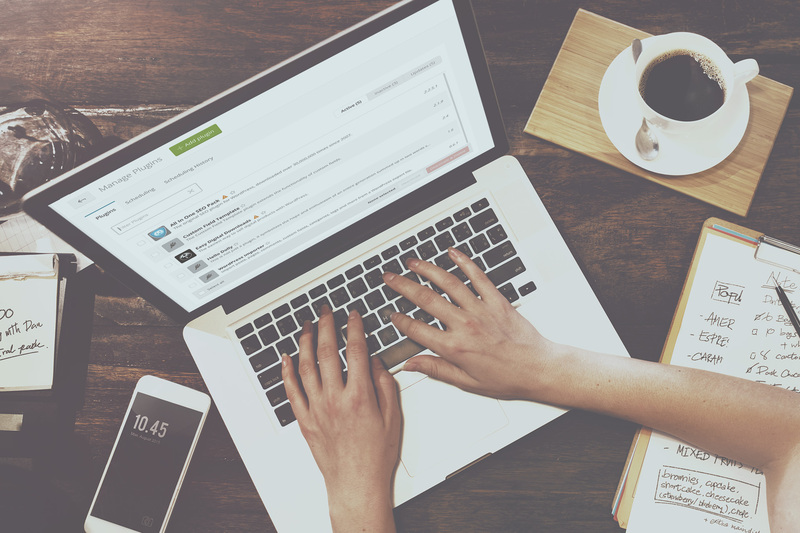 Say goodbye to manual updates & hello to automatic updates! One of the most time consuming and frustrating tasks in WordPress is making sure that everything is updated. Otherwise, you risk security breaches of your and your client’s websites. So far, the only way to make sure that everything is top-notch has been by regularly logging in and performing bulk updates or Safe Updates across your websites. 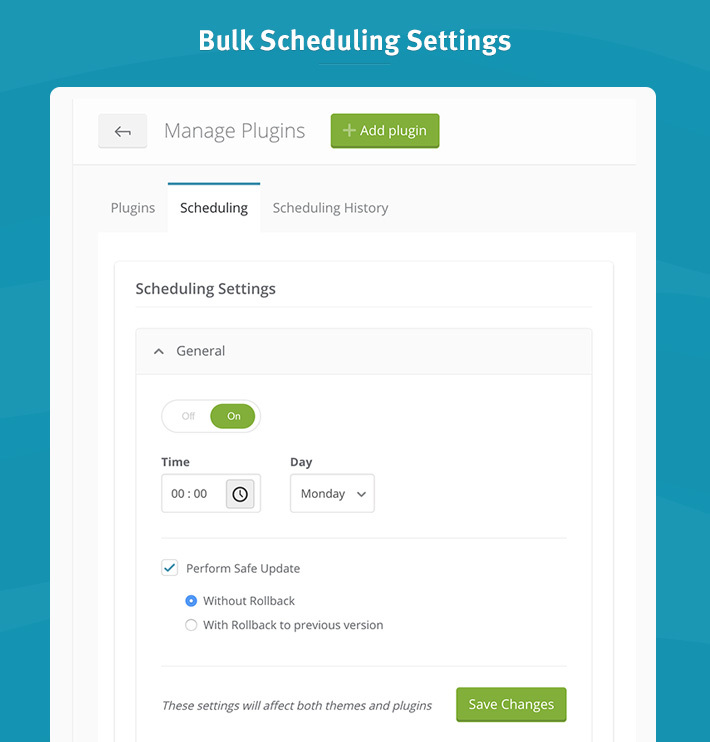 From now on you can schedule all of your updates, across all of your websites on ManageWP. That goes for regular and Safe Updates, giving you also the option to rollback if something goes wrong. Imagine logging into ManageWP and not seeing 137 pending updates, knowing that all of the updates were done when your website traffic was at its lowest. The ability to schedule updates gives you the flexibility to select the most convenient time and date for your updates, so that in case something does go wrong, it’s when 90% of your customers are sleeping. 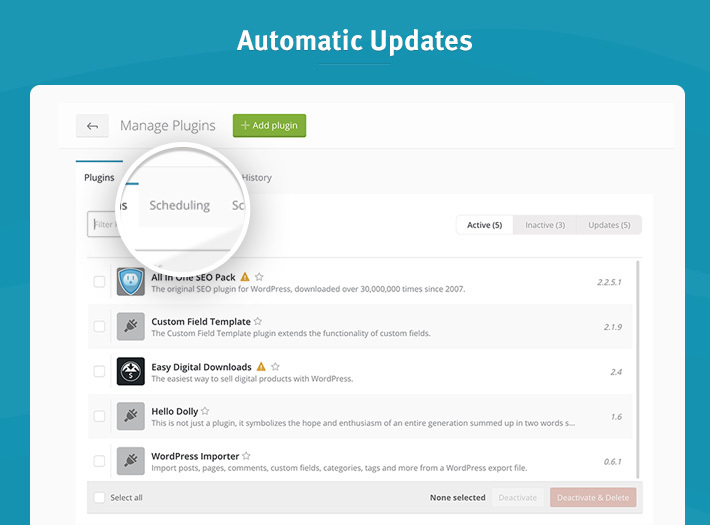 Rather than thinking about when you scheduled your plugin updates versus when you scheduled your theme updates, with our automatic updates you know that it’s all being updated at the same time. On top of that, you can choose to whom you want your notifications to be sent to. Clients and collaborators can only receive notifications for the websites they have been assigned. Also note that custom notifications can only be set on a single website, for bulk websites we ask you to use your global settings. Otherwise, it can all get too confusing, don’t you agree? Knowing what’s scheduled and what’s not is also right there for you. When looking at your plugins and themes in your dashboard you will notice that we have added a new tab. 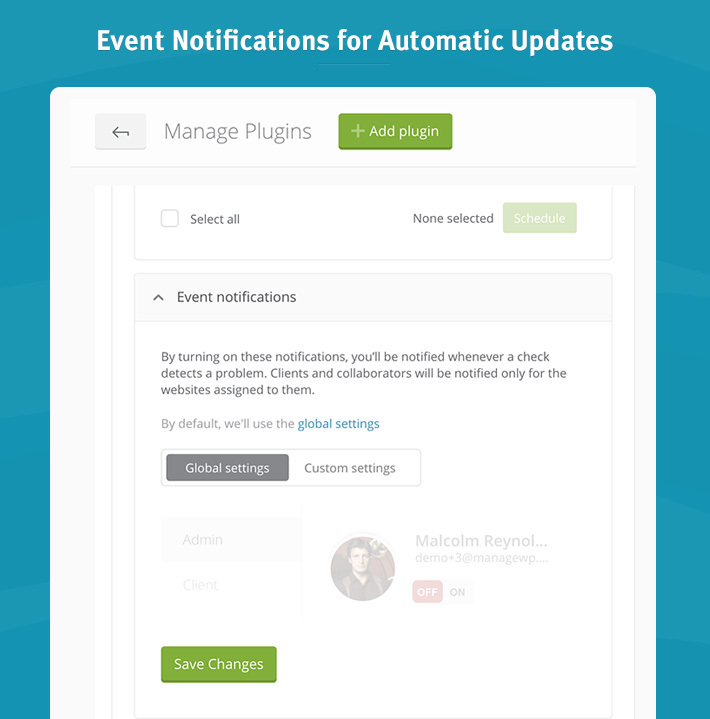 You can keep an eye on what plugins and themes will update automatically. That way you can always be sure that you are updating everything that you need regularly. No more waking up in the middle of the night trying to remember if you scheduled that update! If you are a Safe Update aficionado, you will be happy to know that you can automate them them too. Just make sure that you have the premium backup solution enabled on your selected websites. You want a fresh restore point available to automatically roll back to, in case something goes wrong. Are you as excited as we about this feature? Here is a step by step guide to get you started! 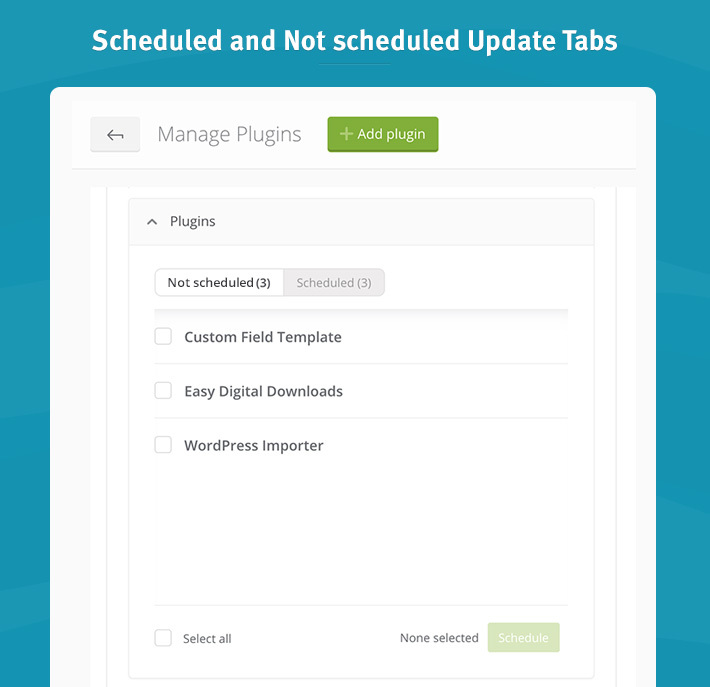 We’ve rolled out with plugin and theme updates. Automatic WordPress core updates are next on our list. Once you are up and running, test it and tell us what you think! Regarding the screenshot comparison, it really doesn’t have to be anything groundbreaking. Even if there’s a subtle change that’s probably fine, it’s ok to have it flag and revert so a person checks it later. So, I guess the FTP option would be needed if the WP site were corrupted to the point that the ManageWP plugin couldn’t handle the update? That makes sense. This hasn’t happened to me yet, but I can see where the FTP option could “save the day” in a worst-case scenario. Exactly. FTP & DB info are optional, but can really save your hide if you quickly (or automatically, in this case) need to bring your site back online. This is amazing! Quick question: If I have save update selected and also the rollback to previous version if a problem is detected, will it roll back if I don’t have the FTP info entered? You need the FTP, but we ask you to enter that before your set the scheduled updates. So that when/if it happens, you don’t have to worry about it, it rolls back. I am excited by this. How about you also include taking screenshot of website before and after the update and then programmatically or use AI to compare if both screenshots are the same? That way we are sure nothing was broken. There are other services that have implemented this. I’d love it of ManageWP could do the same. 1) How will the automatic update know that the site is broken and therefore needs to automatically restore? 2) I tried to restore a website recently and it failed because a plugin gave an error. I had to delete the plugin before I could make it successfully restore. I assume in a case like that, it couldn’t be automatically fixed…? Essentially if we detect that something is wrong we rollback automatically to your latest restore point, which we make at the start of your Safe Updates. That way you have a live website at all times. Then when you login you can see what has gone wrong and fix it. It’s an update system which protects you from having your website crashed by a plugin. I don’t know why this is required, as it’s not required for Safe Updates. Auto rollback should work via my premium Backup option, right? When we rollback and the Safe Update is not scheduled, if we need the FTP credentials we will ask you there and then. However, when the updates are scheduled we need to make sure we have everything in advance so that in case something happens we can rollback when you are not sitting next to your computer. I’m feeling a little cautious about this…. But am looking forward to hearing from others how they find the feature. My concern is that if using this new feature, even if doing Safe Updates, when an update breaks something, don’t we still need to manually roll back the restore? So even though we are automating updates, we still need to be at the PC while it’s happening, right? However, it’s always good to check the website after the update; there are use cases where an update breaks a site in a way that ManageWP cannot detect (e.g. login does not work, or a contact form doesn’t fire off an email).